Yael Kanarek’s practice centers on the fundamental hypothesis that language and numerals render reality, and that this reality is an entirely subjective, unified field. Through the shuffling of physical properties that construct our use of language, such as matter, shape, and sound, Kanarek's work examines how verbal signifiers operate emotionally. Employing modes of authorship such as storytelling and multilingualism, Kanarek manipulates the biographical predisposition of cultural associations. As an Israeli-American, her perception is tempered by an awareness of post-national borderlines. Her work enters spaces of meaning determined by a global network and the negotiation of identity that occurs when confronted with multiple systems. Crossing these sensibilities with her observation of the internet as a network made of language—human and computer—her most recent projects document the consciousness shift from a Modernist self to that which is networked. "World of Awe is an ongoing multi-platform project. 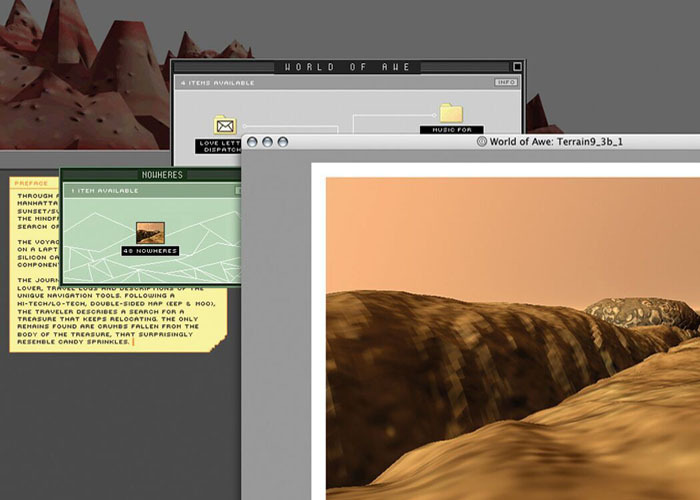 Centering around three chapters created between 2000 and 2006, the work follows an unnamed Traveler through a desolate virtual world, Sunset/Sunrise, which is accessed through a portal in New York’s East Village. "Chapter 1: Forever" . . . unnamed Traveler searches for a lost treasure, narrating their yearning from a laptop that they have rebuilt from electronic scrap. Visitors access the Traveler’s story by opening their files, reading accounts of their journey and their love letters.